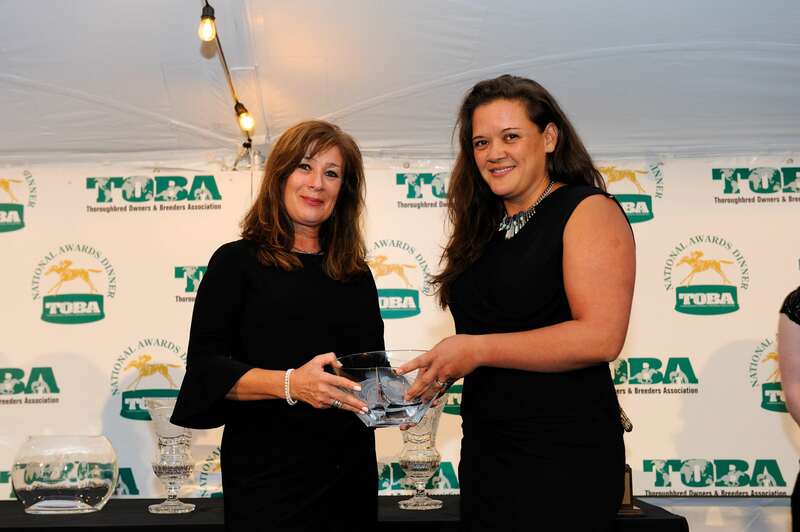 “TOBA is pleased to have established this award in partnership with ELCR to help increase awareness of the importance of land conservation to the Thoroughbred industry and to serve as an inspiration to others within the industry,” says TOBA President Dan Metzger. Helen Alexander (2014) Helen was selected as the recipient of the inaugural Robert N. Clay award because of her commitment to ensuring that the nation’s most beautiful and productive agricultural and open lands are preserved for future generations. 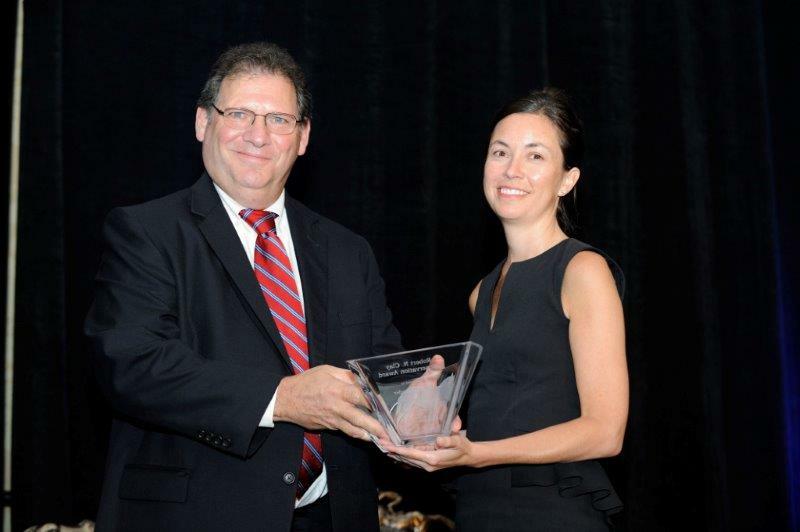 ELCR Vice President, Dan Rosenberg, presents the Robert N. Clay Conservation Award to Mackenzie Royce, Executive Director of the Bluegrass Conservancy, accepting on behalf of Helen Alexander. In addition to her conservation work with her family in the Brandywine Region of Pennsylvania, Helen is the co-founder with Robert N. Clay of the Bluegrass Conservancy (BGC) land trust in Kentucky . She was elected as the Founding President of the BGC and has served in that capacity since its inception in 1995. Under Helen’s leadership, over 20,500 acres have been permanently protected through conservation easements. Ms. Alexander also served on the panel that formulated the model for the Purchase of Development Rights on farmland in Fayette County, Kentucky. She helped to lead the program through its adoption and subsequently served on the PDR Board. To date 28,000 acres, including 133 horse farms, have been permanently conserved under the PDR program. Robert Sanford (2015) Bob Sanford was selected as recipient of the Robert N. Clay Award because of his commitment to equine land conservation and ensuring equine access to public land. Mr. Sanford tackles equine land conservation on the legislative front, fighting and succeeding for legislation in North Carolina that impacts issues of the equine industry. He untiringly fights for positive change regarding legislative action, education and health issues that represent the equine community’s contribution to recreation, agriculture and the economic well-being of North Carolina. ELCR Vice President, Dan Rosenberg (right), presents the Robert N. Clay Conservation Award to Robert Sanford. Mr. Sanford has served in numerous leadership roles within North Carolina’s equine industry. He is currently vice president of the North Carolina Horse Council (NCHC), and previously served as president for many years. He also served on the seven-member Equine Study Executive Committee for the NCHC that released a series of equine industry recommendations in 2009. Bob owns and operates a breeding and racing farm in Northern Durham County, North Carolina. He is also a Foundation Board Member of the North Carolina State University Veterinary College and a past Board Member of the North Carolina Thoroughbred Association. Peter Fenwick (2016) Peter Fenwick, a lifelong horseman and Thoroughbred owner, was selected for his commitment to conserving the land and equestrian lifestyle of the Baltimore County, Maryland area. Mr. Fenwick has served as a board member of the Valleys Planning Council (VPC) since 2001 and as president since 2005. The VPC was started in the 1960’s by a group of individuals, many of which were horsemen, with the vision and foresight to preserve the historic character and maintain the rural feel and land uses in the valleys amidst the threat of urbanization and sprawl associated with the construction of the Beltway through Green Spring Valley. Today with over 62,000 acres of land under conservation easements, Baltimore County has more conservation easements than any other county in the state of Maryland and the VPC continues the tradition of protecting the agriculture and equestrian lifestyle and heritage of the area for the benefit of future generations with the conservation of over 30,000 acres of land. 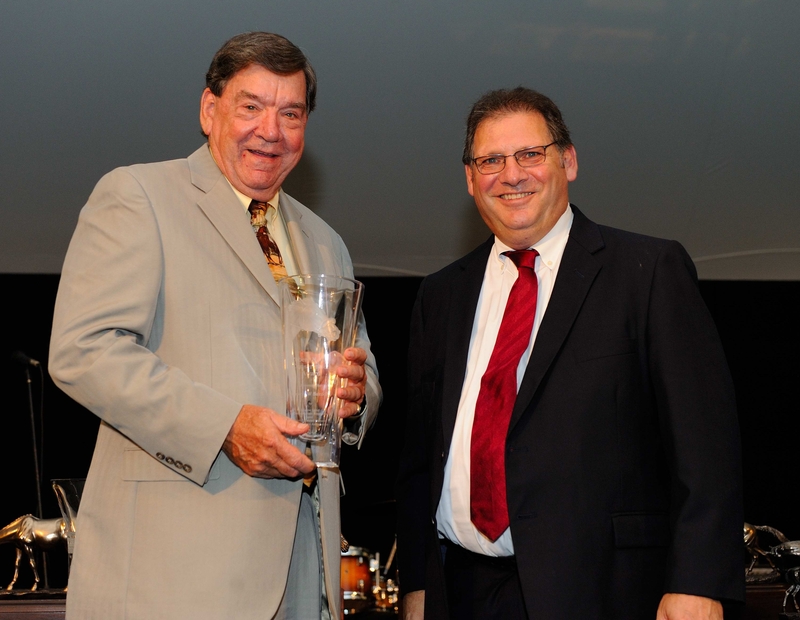 ELCR Vice President, Dan Rosenberg (right), presents the Robert N. Clay Conservation Award to Peter Fenwick. Horses represent a significant part of the history of Baltimore County with over 10,000 horses comprising an equine inventory valued at over $121 million. Steeplechase racing and fox hunting are major activities in the VPC territory. Four major events are held in the area each year: Green Spring Point-to-Point, Grand National, Maryland Hunt Cup, and Legacy Chase. The Grand National and Hunt Cup races date back to 1898 and 1894 respectively. 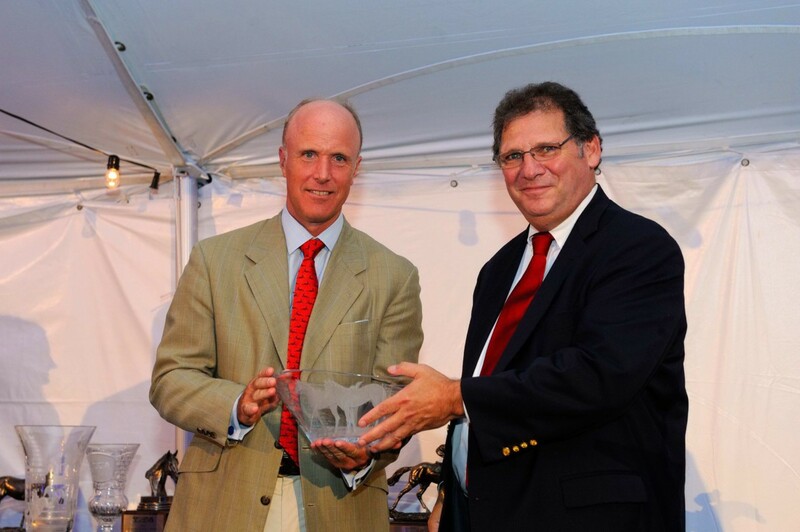 Peter Fenwick continues to demonstrate his commitment to conserving the land and equestrian lifestyle and heritage of the area through his dedication to the mission of VPC and by serving on the board of the Maryland Steeplechase Association and as chair of the Grand National Steeplechase and member of the Green Spring Valley Hounds. 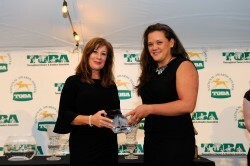 ELCR’s Executive Director Holley Groshek presents the Robert N. Clay Conservation Award to H’Krih Shelhamer. Quail Roost Farm II as horse land. The Heubecks are associated with the development of early thoroughbred farms in Marion County, and subsequently developed their own unique property, Quail Roost Farm. Harriet and Elmer both passed away in 2003, and their son Kerry sought to protect the 1,000-acre Quail Roost II as a memorial to his parents. Kerry, along with new owners James and Lee Windham, workedwith Conservation Trust for Florida to protect and limit development on approximately 800 acres of Quail Roost II as a working thoroughbred and cattle farm. George Strawbridge, Jr. (2018) Strawbridge, through his Augustin Stable, has been an important player in both flat and steeple chase racing and an industry leader. He has also been at the forefront in land conservation. Over the years Strawbridge, has purchased several farms in Pennsylvania with the purpose of establishing a conservation easement on the land to preserve the beauty and function of the property. While some of the properties were subsequently sold once an easement was in place, he retains ownership of over 900 acres of farmland in Pennsylvania, all of which are under conservation easement. 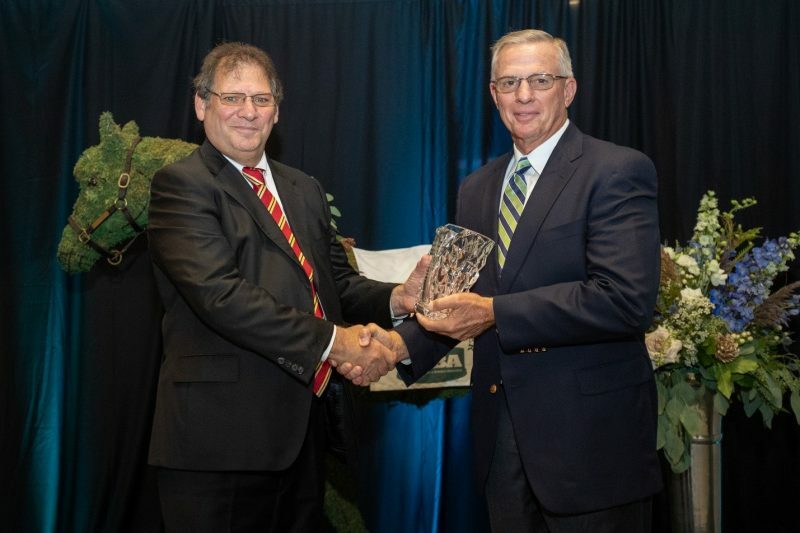 Dan Rosenberg (Left) Vice President, Equine Land Conservation Resource with Bruce Hill, Manager Live Oak Stud, accepting the award on behalf of George Strawbridge, Jr.
George has been recognized as an ardent supporter of open space preservation for decades. His donation of multiple conservation easements to the Brandywine Conservancy, since 1993, has protected over 2,500 acres of land in Lancaster and Chester counties. Strawbridge was one of the original investors in the Buck and Doe Associates Limited Partnership that bought and conserved the King Ranch Property totaling over 5,000 acres. Strawbridge is an active trustee of the Brandywine Conservancy and encourages landowners to conserve their properties so that future generations have a chance to appreciate the land before it is lost to development.